Enter President Stroble addressed gala attendees in front of a Sema Jonsson exhibit, "Women Who Inspire." Webster Geneva alumna Azania Noah (bottom right) performed several songs from her years at Webster. 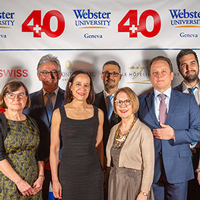 A weekend of activities recognizing Webster University Geneva’s 40th Anniversary culminated with a gala fundraiser with alumni and friends, over a celebration evening of cocktails, art, music, dinner and dancing at le Domaine du Grand Malagny in nearby Genthod on Saturday, March 23. Proceeds from the evening benefited the Webster University Geneva Scholarship Fund. The gala on Saturday kicked off with a reception and gallery exhibit, “Women Who Inspire,” by artist Sema Jonsson, featuring her series of over 100 portraits of women leaders past and present. Beatrice Fihn, executive director of ICAN and subject of one of the portraits, was present. ICAN, The International Campaign to Abolish Nuclear Weapons, is a Nobel prize-winning NGO who represents a coalition of non-governmental organizations in one hundred countries. The featured exhibit recalls Webster University’s humble origins and founding in St. Louis, as a pioneering initiative that became the city’s first college dedicated to women’s education. Current student Emil Brew-Butler served as the master of ceremonies for the evening, and later as DJ, while participants also heard addresses from Webster University President Elizabeth (Beth) J. Stroble, Provost, Senior Vice President and Chief Operating Officer Julian Schuster, and Webster Geneva Director General Clementina Acedo. Testimonials were also shared by Christian Milliet, president of the Webster University Geneva Alumni Association, as well as from current bachelor student Belinda Mziray, who spoke of the human impact of scholarship funds. Learn more about the gala and fundraiser in this Webster Geneva post. The entire weekend March 21-23 included events recognizing academic department alumni and their achievements and showcased some of the university’s current activities and initiatives. Learn more about those activities and see additional photos in this Webster Geneva post.